"The Battle for Tomorrow is About to Begin...". 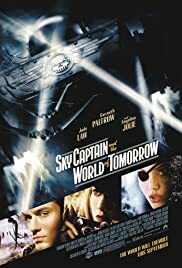 When scientists the world over keep disappearing without a trace, it's up to intrepid reporter Polly Perkins and top aviator Sky Captain to uncover the truth in this futuristic, Art Deco-style actioner. The task involves putting their lives at risk as the pair travels to treacherous locales, hoping to throw a wrench in the plans of a villain who aims to wipe out the planet.